Tiffany Plantation is a Patio home community consisting of 36 single family residences individually owned and custom designed. Located just off Hillside Drive and 9th Ave North, it is just blocks to the beach and Main Street with the shag clubs. And these homes are so nice! Each home is different, but in a complex with limited yard space and an effort to fit in with the beach style...palm trees and blooming plants all over. Homes can be one or two-story, some with porches and fireplaces. The complex offers a community pool and gazebo. Most of these homes were built in the late 80's but have been well-maintained and updated. These are not luxury homes, but you'll be in your own private paradise when you own one. There are two and three bedroom patio homes, and prices start from just under $200,000. A similar development is just across the street called Tiffany Woods. This community has a wall around it, and it makes for even more privacy in each neighborhood. 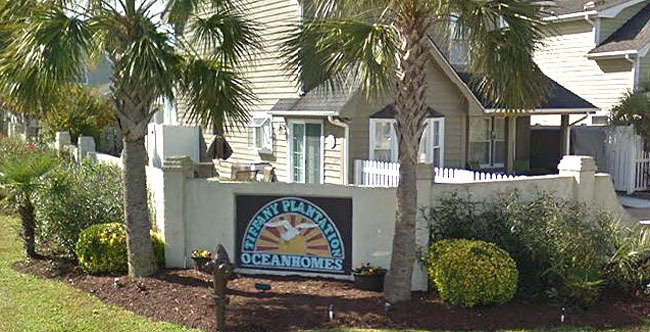 Tiffany Plantation is one of the best-kept secrets and nicest places to live in North Myrtle Beach. Very few homes come up for sale, and they don't last long. So if you think you might be interested, be sure and call us quickly.